Base compaction is what supports your hardscape elements, the same as your home’s foundation supports its walls. When you started dreaming about your new Landscape project, which words and images came to mind? Relaxation, outdoor living, entertaining, roasting marshmallows, gardening… COMPACTING?!? Yeah, probably not compacting. Most of the rest of this website will deal with the parts you did envision… the fun stuff. 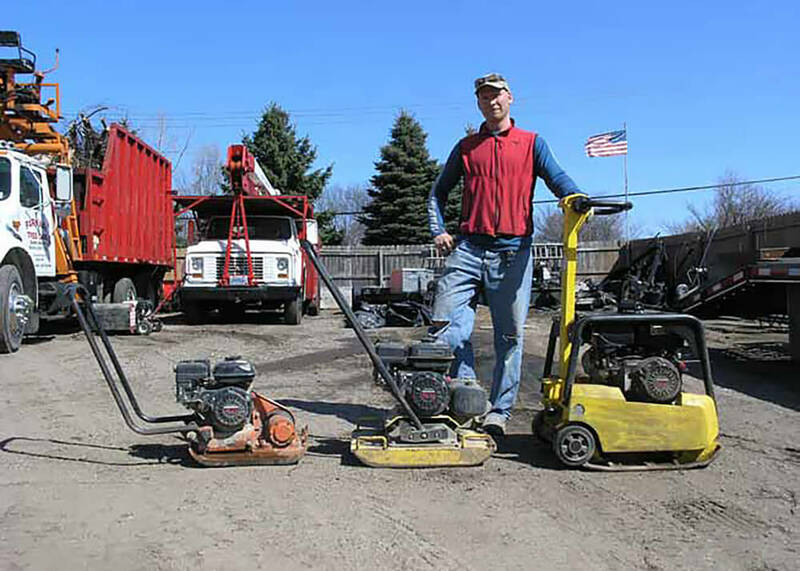 But this article will explain why you should care about compaction and why it may be the most important part of your Minneapolis landscape investment. The bones and structure of your landscape project are the hardscape elements. The patios, sidewalks, sitting walls, retaining walls, fireplaces, outdoor kitchens, etc. – these define the purpose of the different spaces in your yard. They are like the walls that divide the different rooms in your house. The softscape elements are the pretty decoration… the paint, flooring, furniture, window coverings, etc. No matter how nicely you paint or decorate a house, you can’t make up for poorly designed and laid-out rooms. So the hardscape elements of your landscape are extremely important. Base compaction is what supports your hardscape elements, the same as your home’s foundation supports its walls. 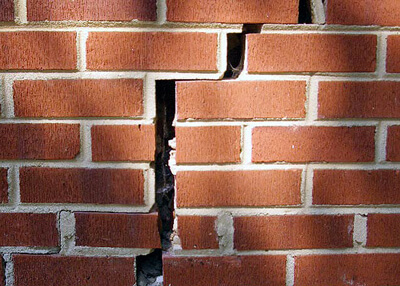 If you have a foundation which is sinking and falling apart, does it matter how nicely the walls are painted or whether the drapes coordinate? Not really. Not when the floors are settling and the walls are cracking. Everyone wants a home with a good, solid foundation. And thus every attractive landscape must also have a solid, reliably compacted base, or else the pretty parts are made worthless. Have no fear! There is a solution for this compaction problem. The solution has been tested, measured, compared, and deemed superior to other possible solutions, by the Interlocking Concrete Pavement Institute, among others. Teams of experts spent years on this and it turns out, after much study, that the most reliable, best way to ensure super-solid compaction of base materials, is… wait for it… USE A REALLY BIG COMPACTOR! We can thus infer that when it comes to compaction and selecting one’s compaction equipment, according to the ICPI… SIZE DOES MATTER! All joking aside, it doesn’t matter how you use it or how long you drive it around. A small compactor simply cannot do the same job as a big one. Small compactors are lighter and don’t hit as hard as big ones. We can see this from a manufacturer’s website, Wacker Neuson, because they publish the lbs/ft force their compactors exert. The compactor in the middle of this picture weighs 190 pounds and hits for 3375 lbs/ft. Many contractors use that machine as their primary means of compaction, because it’s light enough to move around without equipment and you can rent one anywhere. We don’t even use that one anymore. For sale, cheap! 190 pound compactor! We use the big one on the right, which weighs 390 pounds and hits for 6675 lbs/ft. 6675!! That’s DOUBLE the middle one. That’s not even our biggest compactor. For driveways, where massive overkill sounds about right, we’ll bring out our 915-pound beast which hits at 12,364 lbs/ft. That’s the big compactor in the top picture. If everyone used compactors like these, settled hardscape elements would become so rare, no one would even think about it. Instead of warranties, at the end of the job we’d just give you a big hug, and you’d feel like it was more than a fair deal! It begs the question, then – Why doesn’t everyone use big compactors? If you said because of weight and cost, you are right. The compactor in the middle costs about $2,300 new and can be moved in a wheelbarrow or dragged around. The one on the right is $5,500 new and you might be able to pull it over some grass, but you need equipment to get it in and out of the truck. The top big one can only be moved around with equipment and costs over $10,000 new. We were able to get ours “lightly used.” We chose to make the investment because we’ve been installing a lot of hardscape elements for a lot of years, and we like to be able to sleep at night. When hiring someone to install hardscaping, make sure they intend to use a big compactor to prepare your base. It may seem like a weird thing to ask, but that will tell you right there how serious they are. It’s a big deal. It is something to worry about. Don’t let the threat of poor soil compaction ruin another night’s sleep. You too can rest easy, knowing that your beautiful hardscapes are being solidly held by their deeply compacted base. Ahhhhhhhhh…. Outdoor living never felt so good!